I took these pictures of my latest completed knitwear piece, the Shalom Cardigan by Meghan McFarlane of "Involving the Senses," before the tornado and storm ripped through Chattanooga last Monday (and left us with downed trees and no power for a day). You can see the early pinky-salmon color blooms of the quince bush in the background. This was a quick knit for which I used Classic Shades and one ball (down to the last 2-3 yards) of Marathon Sock yarn (both by Universal)— held together—to achieve gauge. 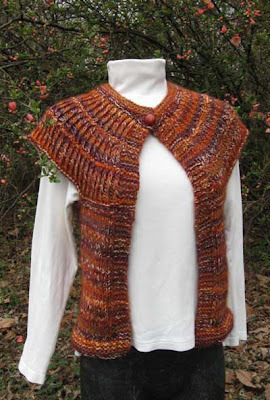 This piece is knit from the top down and after the easy but somewhat slower-paced twisted rib collar, the rest was a breeze. 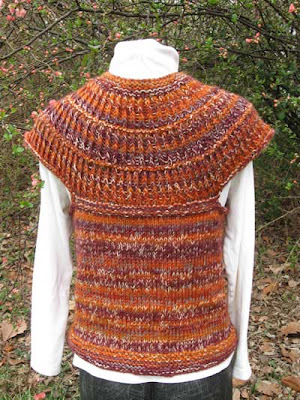 Several knitters have knitted this cardi and have added their own variations. See Sophy's version and Ishi's version that incorporate a short sleeve and additional buttons, and a funny story from Stitch1Peta on her experience. Added 2 extra stitches to the underarm cast-on row. Included a garter ridge at the underarm to minimize curl. Eliminated all body shaping. Used the "Tight One-Row Buttonhole" as described in The Knitting Answer Book by Margaret Radcliffe. A future version might include using a smaller needle for the garter hem or an alternate reversible stitch pattern. I also might change the position of the arm holes as they seemed to be shifted somewhat toward the back rather than at the sides. Detail of vintage button closure. I've worn this vest 2-3 times and have gotten several compliments. Oh, and pockets might be another variation for the next version! Here is the book with the buttonhole technique. It has a plethora of info in an easy-to-read Q and A format. A great addition to any knitter's library.